In the previous post we looked at how to deal with static files in .NET Core. Examples of static files include JS, CSS files, images and HTML pages such as index.html. They are normally placed within the web root folder called wwwroot in an ASP.NET project although we can configure other folders in code. These static files are not reachable via a URL at first. Navigation needs to be turned on in Startup.cs using specialised middleware. Hence handling static files is a good example of the modularity that .NET Core claims to display. We also saw how to activate the built-in welcome page via another middleware. It is also a static page and its main purpose is to check whether our ASP.NET web application has been correctly started by the web server. We also saw how to serve up a default and a customised home page for the site visitors. In this post we’ll investigate the various environments available for an ASP.NET Core project. By environment we mean the type of environment the application is running in. Typical environment types are Production, Staging, Testing, Development, Alpha, Beta and the like. It’s normal that developers first test a new feature in the Alpha/Testing/Development environment, then if it’s approved the application is deployed to Beta/Staging and if all looks good then all new features and bug-fixes are deployed to Production. The environment chain may have more steps, such as Dev, Alpha, Beta, PreProd and Prod. The point for our current discussion is that the settings applied in each environment will invariably differ by environment. A good example is the database connection string. Each environment will get its data from separate databases with their respective connection strings. Customisation is therefore highly appropriate when talking about application environments and their settings. The goal of this post is to explore what’s available in .NET Core in this regard. 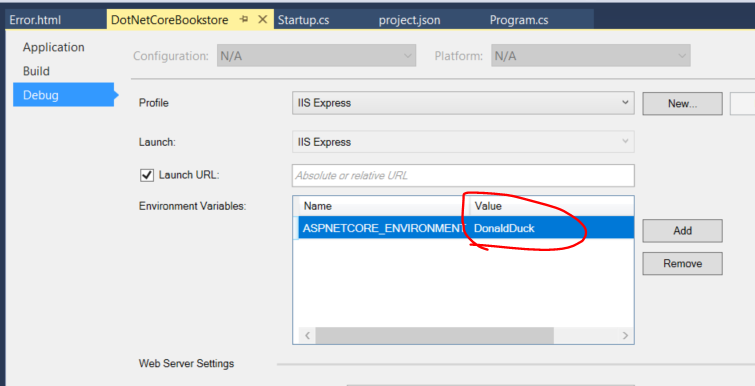 We’ll be working in our demo application DotNetCoreBookstore. Another source of information on this topic is the relevant Microsoft information page available here. The predefined magic string for the development environment is exactly “Development”. That’s how the IsDevelopment function determines whether the application is running in the dev environment. There are two more predefined environment types: Staging and Production. The corresponding boolean functions of IHostingEnvironment are called IsStaging and IsProduction. It’s a good idea to show the full exception details in the development environment so that the developers know where to start with the bug hunt. However, in production we certainly don’t want to show that type of information for the clients. One option is to insert a generic error page and show that in the production environment. The following section describes a minimalist solution for this problem. So when the application is compiled for this specific environment then those three setting values are overwritten with the help of the XML transformation attributes. The MongoDbAuthMechanism and ReplicaSetInUse settings remain untouched. Current mood will be “Optimist” as expected. 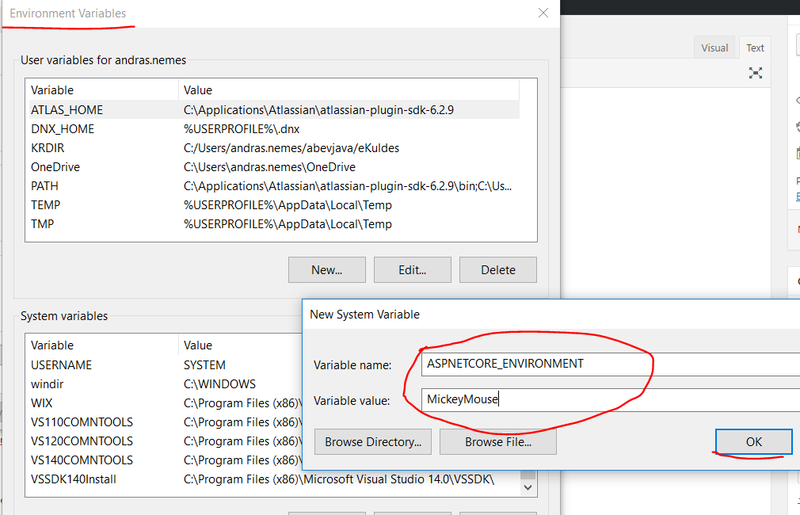 If ASPNETCORE_ENVIRONMENT is set to Production then currentMood will get the value FeelingGreat. The configuration file ‘appsettings.MickeyMouse.json’ was not found and is not optional. We set the “optional” variable to false. Since we have no such file we get the exception. That’s all about the basics of environments and settings in ASP.NET Core. We’ll continue in the next post.